Depression is one of the most common diseases in the world at all. It belongs to affective disorders. About 70% of the population suffer during their life from a depressive episode, similar to low back pain. The origin may be different , e.g. death of a relative, divorce, problems with employment such as firing, insolvency etc. Depressive episode may produce dullness, draw back from social surroundings, problems with inappetency and sleep. In severe cases ideas of suicide may occur. Typical for this disease is a feeling of worthlessness. Psychotherapy and medicaments are the treatment of choice and help in the majority of cases to overcome the symptoms of depression. About 10% of these patients cannot be cured by this therapy . When intensive psychotherapy including electro cramp therapy (ECT) do not alleviate the symptoms, VNS can be discussed. 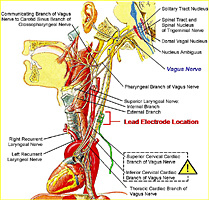 What does Vagus Nerve Stimulation do? VNS is a well established treatment in special types of epilepsy. In der 1990s one has found that in may patients treated with VNS due to epilepsy concomittant depression could be improved. 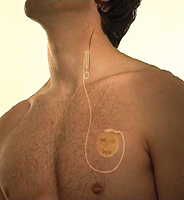 Since 2001 VNS therapy is approved in Europe and since 2005 approved by the FDA in America as well. 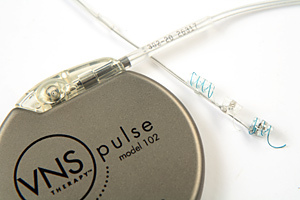 Studies also published recently show, the VNS to be a valuable tool in therapy of chronic depression, resistant to all other types of therapy. How does the implantation procedure work? The electrodes made of platin are implanted in a surgical operation which lasts for 1-2 hours and is performed under general anesthesia. After an incision on the left side of the neck the nervus vagus (10th brain nerve) is microsurgically exposed by the neurosurgeon without any damage to the nerve. 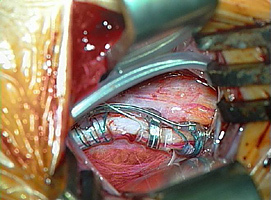 The electrode is tilted around the nerve, sutured and with a cable under the skin connected to the generator which is implanted in the left thorax similar to a heart pacemaker. Stimulation is programmed some days later by the psychiatrist who will follow up the patient. 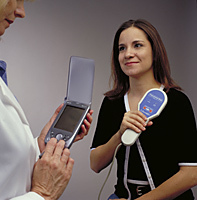 Stimulation lasts for certain time intervals which will be programmed according to the symptoms of the patient. Thererfore it is necessary to stay some days after the operation in the department of psychiatry. The operation itself is done on inpatient basis for 2 days. The risks are minimal when choosing a well trained neurosurgeon. What do I have to do to know if I am a potential candidate for VNS? The decision if VNS should be seriously taken into account does the treating psychiatrist. He must be familiar with programming and follow up. I as neurosurgeon do the implantation but do not take over the treatment and the programming. The psychiatrist wil guide you through the whole follow up therapy. Which side effects can occur? Side effects such as hoarseness, change in voice loudness and tone sometimes coughing and pins and needles sensations on the skin can be minimized by programming and most patients get accustomed to them over the time. Which patients cannot be treated with VNS? The main reason is that the treating psychiatrist does not opt for VNS. But patients having undergone vagotomy, or sleep apnea and harbouring certain pulmonary and cardiac diseases must be excluded from this therapy. Which costs do I have to be aware with? Not all insurance companies actually cover the costs for the system ( about 14.000 €) and the operation and hospitals stay including anesthesia (about 10.000€). So if your treating psychiatrist has decided to opt for VNS normally a letter of coverage from the insurance company is mandatory. If you have further questions please do not hesitate to contact me.